An Electro Permanent Lifting Magnet is composed of two sets of permanent magnets: one set of magnets with fixed polarities, and one set of magnets with reversible polarities. A DC current pulse in different directions through a coil around the latter reverses its polarities and makes the EPLM in two statuses: with or without external holding force. The EPLM needs the DC current pulse for less than one second in order to be activated and deactivated. During the whole period of lifting a load the EPLM doesn’t need any electricity any more. Electro permanent lifting magnets are electricity activated to switch on and switch off it magnetic holing power. They use electricity for a few seconds only and have consistent attractive force to the load lifted even in failure of the power supply. 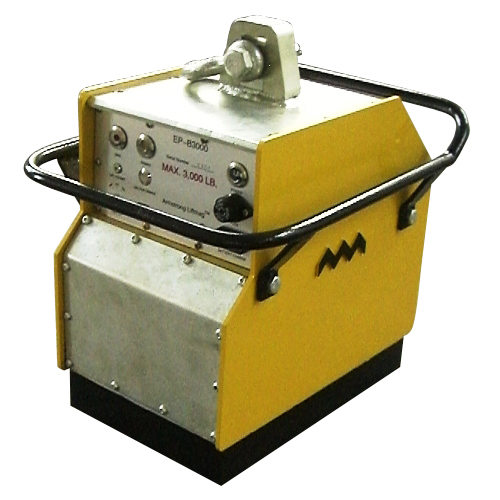 Electro permanent lifting magnets can be operated / controlled at its front panel or by a wireless remote control (Optional). By clicking the MAG button, the first and a partial magnetization would trigger and therefore a partial lifting capacity could be achieved while the EPLM and the metal load are still resting on the ground. Once EP-B begins to be lifted up (or the hoisting rope is in a certain tension), a full magnetization would be processed automatically and the electro permanent lifting magnet would then reach its full lifting capacity. This feature ensures a larger margin for safety. Electronic and mechanic locking systems prohibit EPLM to release loads while the electro permanent lifting magnet is lifting the load off the ground. For better safety, DEMAG button and UNLOCK DEMAG button must be pressed simultaneously to demagnetize EP-B electro permanent lifting magnets and release loads. The lifting capacity can be easily adjusted to 3 different levels, MAX, MID or MIN, by turning the knob of ADJUST LIFT CAPACITY. In the case of lifting more than one metal sheet at a time, you can adjust its lifting capacity to a weaker level.